Watch the on demand archive presentation and download handouts by clicking the link below and entering the requested registration information. If you had previously registered for the webinar, select "Already Registered?" above the First Name field and enter your e-mail address. How to foster "possibility thinking" to help students open up their thinking and learning in creative ways. The process of lesson unplanning, a way of transforming existing lessons, activities, and assignments into more complex classroom challenges. Four basic action principles that teachers and students can use to design and solve complex challenges both inside and outside the classroom. The steps for creating legacy challenges, which require students to identify a problem, develop a solution, and ensure that their work makes a positive and lasting contribution beyond the walls of the classroom. 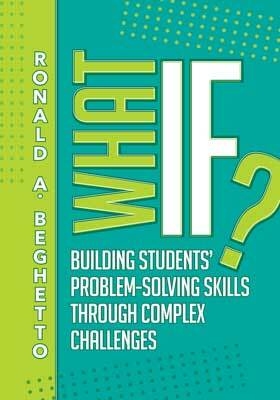 Ronald A. Beghetto is an internationally recognized expert on creativity in educational settings. He is professor of educational psychology in the Neag School of Education and director of the Innovation House at the University of Connecticut. He is editor-in-chief of the Journal of Creative Behavior and a fellow of the American Psychological Association and the Society for the Psychology of Aesthetics, Creativity and the Arts.